Well-kept holiday residence under Swiss direction, 150m from the beach - App. No. 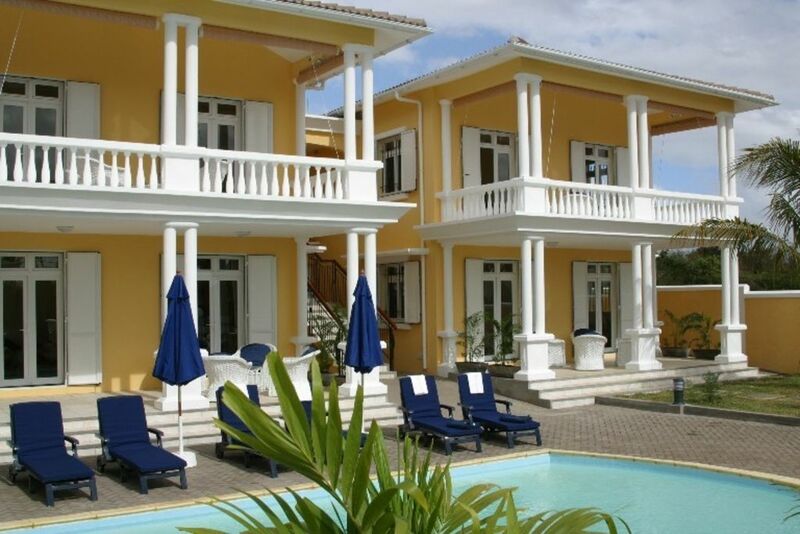 3 "Terrasse"
The spacious 3 1/2 room apartment is located in the left Villa upper floor. All 4 apartments have the same modern and clean facilities. The large covered terrace is equipped with a comfortable seating area and dining table and chairs and invites you to relax. Enjoy a glass of wine, the mild evenings outdoors. The residence 'Mo ti Paradis' is located only 150 meters from the beautiful Trou aux Biches beach, in a private residential area with no through traffic. The -2- villas are divided into 4 units of 125 m². For large families or holidays with friends, you also have the option of multiple units to rent. Each of our -4- units has the same well-kept interior, which certainly meets European requirements. The kitchen is well equipped. --- The living / dining room with an adjustable ceiling fan is spacious and tastefully decorated. --- Both double bedrooms have air conditioning with remote control, and each with its own accessible bathroom with shower / toilet, washbasin etc. ---- Included in the rate. There is daily housekeeping (u except on Sundays. Holidays), periodic replacement of linen, daily fresh towels and beach towels. --- Wireless connection in each apartment. In addition, each apartment has a safe, and an additional storage room for your luggage. For the beach, beach chairs, umbrellas and a small cool box are available in the residence. 24 h Security. Arrival: We will advise you on your flight bookings from all major European airports. In high season, we recommend an early flight reservation. We will gladly arrange: excursions, car hire, airport transfers in Mauritius etc. The under Swiss direction Residence 'Mo ti Paradis' guarantees on-site support, and an excellent service. daily fresh towels and even beach towels! Equipped with a hairdryer and European power adapter. Each unit has its own hot water boiler. Each unit has a safe and an additional storage room for accommodation of your luggage / sports equipment. Moreover, a drinks depot is at cost price. Daily cleaning (except Sundays and holidays) is included in the price. If desired, the preparation of a Creole menu by a cook in your home can be ordered. The price depends on the menu choice. Fantastic location. Clean, comfortable apartment. Helpful staff. The location for this property is fantastic. It is a 2 minute walk to a wonderful beach - where we were lucky enough to see and swim with a sea turtle. There are a couple of excellent restaurants within 10 minutes walk, and a well stocked supermarket just round the corner. Joel and his team manage the property to a very high standard and are extremely helpful. We had a wonderful holiday, thank you! Thank you so much for a wonderful holiday. Mo ti paradis is wonderful. We enjoyed our stay so much that we would like to return in December 2008. Thank you again for a very special stay. Très agréable terrasse dont la surface est comprise dans la surface habitable. Jättefin lägenhet med allt man kan behöva. Bra läge nära supermarket, restauranger och den fina stranden. Mycket bra städning och service. Vi kommer gärna tillbaka. Nous avons fait part à la propriétaire de notre satisfaction quant à la qualité du logement et aux services qui y étaient rendus par le personnel. Aussi dans l'avenir nous nous engageons à fournir le meilleur service possible à nos clients. Auch in Zukunft werden wir uns bemühen unseren Gästen den bestmöglichen Service zukommen zu lassen. Wir, 5 Erwachsene (Mutter mit 4 Söhnen) haben wunderschöne Weihnachtsferien im Mo ti Paradis verbracht. Verbringen unsere Ferien immer wieder gerne auf Mauritius und nach verschiedene Hotelaufenthalten bereits zum 4-Mal im Mo ti, wo wir uns zuhause fühlen. Trou aux Biches is located in the northwest of the island and is known for its many kilometers of white, sandy beach. In the immediate vicinity of our villas you will find various restaurants, snack bars, shops, boutiques, doctor, pharmacy, police station, bank, taxi and bus station. Until the lively Grand Baie it takes only 10 minutes, where discos, casino, bars and also many restaurants and boutiques. Golf: Distance to the nearest golf course about 15 minutes by car. In Mauritius, it has about 12 golf courses.